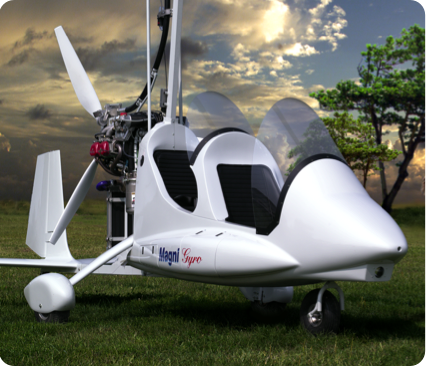 The Voyager has been developed starting from such needs and the result is a gyroplane unique in its category. Large and comfortable, this model maintains a simple and stylish design and features about 150 liters of available storage space (open compartments, document holder and carriers). The characteristic baggage strakes on each side are well harmonized with the fuselage design and are accessible through three compartment doors with double locks. In-flight comfort is provided through a large cockpit that ensures good protection for both the pilot and the passenger, the seat padding and all the accurate details make flying an enjoyable and safe experience. When compared with the M16, the Voyager has a longer maximum range; the new 80 liters fuel tank can easily ensure up to 4 flying hours, with cruising speed between 120 and 150 km/h. The M22 Voyager is powered by 115HP turbocharged Rotax 914 and features Magni’s latest system innovations as the newest cooling and lubrication systems with heat exchanger and thermal expansion valve. It is equipped with the latest version of the Rotax Flydat, a unique digital instrument displaying 9 engine parameters simultaneously. A large number of useful emergency/control warning lights are connected to the instrument system providing information on the rotor brake, exhaust trim, low fuel level and battery charge. The M-22 Voyager maintains the building characteristics of all Magni’s models meeting the needs of those pilots who require a gyroplane allowing fast and safe flights, capable of operations on small semi-prepared strips, granting extraordinary storage space and good in-flight comfort. Manufactured in epoxy resin reinforced with fiberglass. Option - Carbon Fiber Cockpit. Altimeter - Air speed indicator - Compass. Rotor RPM digital counter.